Fun day with Noel and his team. Fantastic atmosphere and really looking after our group of 19 strong. Noel was great meeting before hand and getting the activities setup with nice simple changes made the day fun and awesome for everyone. I am terrified of heights, but the friendly and very professional staff got me harassed in, reassured and ready to jump in no time. They did not try to talk me into or out of anything but gave me facts and a fantastic send-off. The first two seconds 9f the swing was terrifying… And then everything was beautiful. You swing over a beautiful gorge and one of the highlights was being pulled back up and being able to see the plants growing against the cliffs and the waterfall. They let me jump first so “we don’t give fear a chance to grow”, and when the husband jumped, our guide was a delightful company as I watched the swing. Wild 5 does not push you to buy extra bells and whistles, but you can buy a DVD of your swing. They suggested we watch it before deciding if we wanted it. We did. ‘We stopped here quite late one afternoon after a long day elsewhere, we really only came for the views and walks, didn’t realise that there was so much else to do. Unfortunately I only viewed the sites and walked to then overhanging rock but observed a few people do the leap, from a distance it all looked very professional and well managed, I wouldn’t have a problem any other day trusting these people. 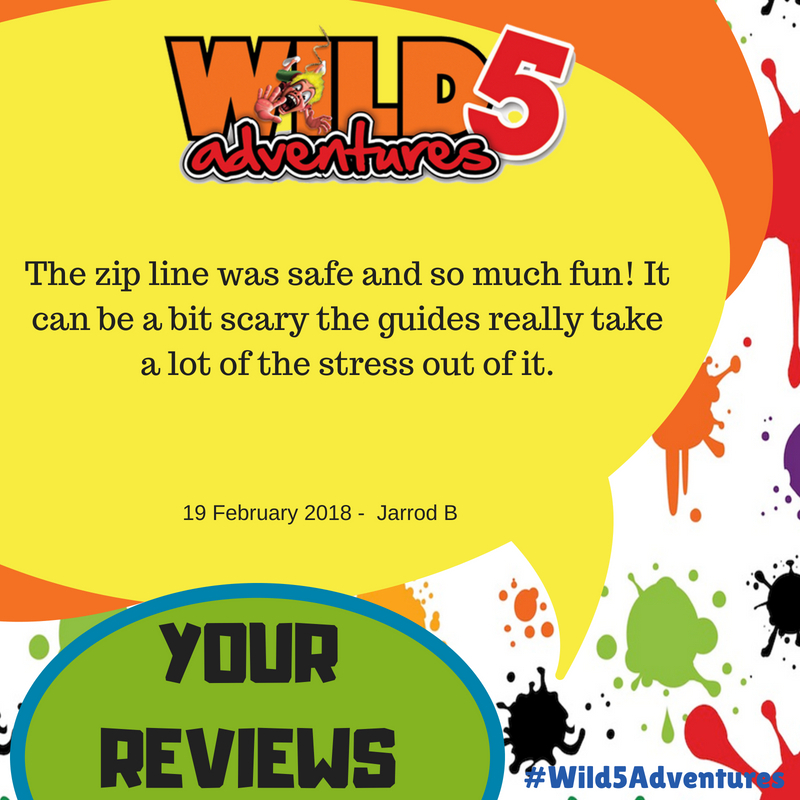 Hi I have so much good and positive things to say about Wild 5 adventures as well as Oribi Gorge itself! 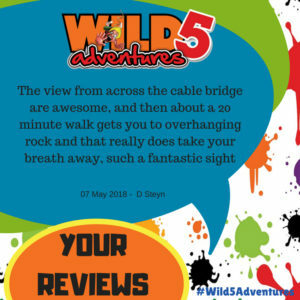 I recently visited the Oribi gorge on a work excursion where we had the opportunity to partake in the wild 5 adventure activities and what an absolute unforgettable experience it was. Definitely a trip to treasure and remember forever. If you are an adrenaline junkie then the wild 5 adventures is most certainly the place for YOU or even if you are a peaceful and you’re just an outdoors lover then this reserve will keep you just as satisfied. This place is truly magical and caters for anyone and everyone. 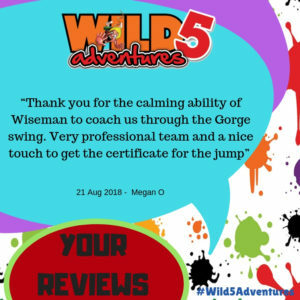 I have been to Oribi gorge on numerous occasions and I have participated in the wild 5 adventure activities. I loved all the activities but one that truly stood out for me was the Zip lining which was much fun!!! This is definitely a place to add to your bucket list as you will not be disappointed at all. I recommended this place as a team buiding outing and MY OH MY did I feel so proud to visit this place once again with all of my fellow colleagues. 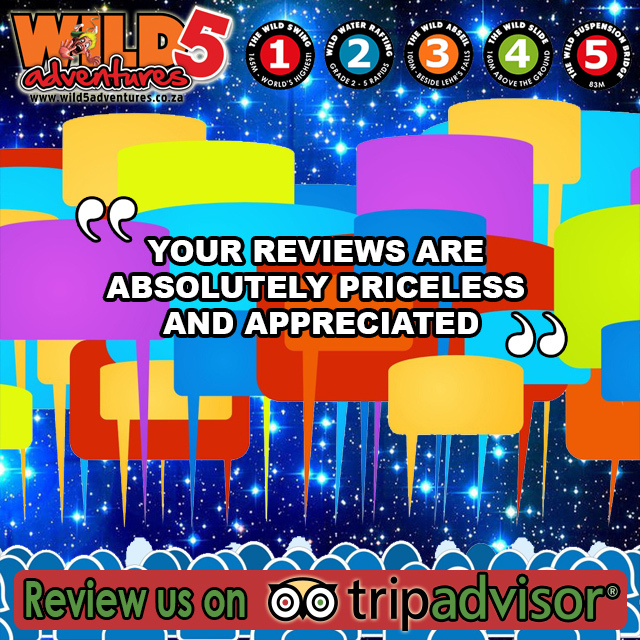 The staff were super friendly and everything just flowed very nicely. This is also one place on earth when time does not fly when you’re having fun. This place allows you all the TIME and FUN you need. I will definitely be back again soon I can promise you that!!! This place can be called heaven on earth anyday because it is for sure! When my daughter turned 10 she told me that she was now old enough to do the gorge swing. I was scared but she was totally overjoyed to do it. With all the safety measures and care taken by the staff there was little need to worry, except in know that my baby girl was growing up. My son has been on the gorge swing twice already and my husband more times than I want to remember. We love all you have to offer and love doing the trail walks as it is so peaceful and beautiful. We make visiting you our priority must do’s every year especially on my husbands birthday. 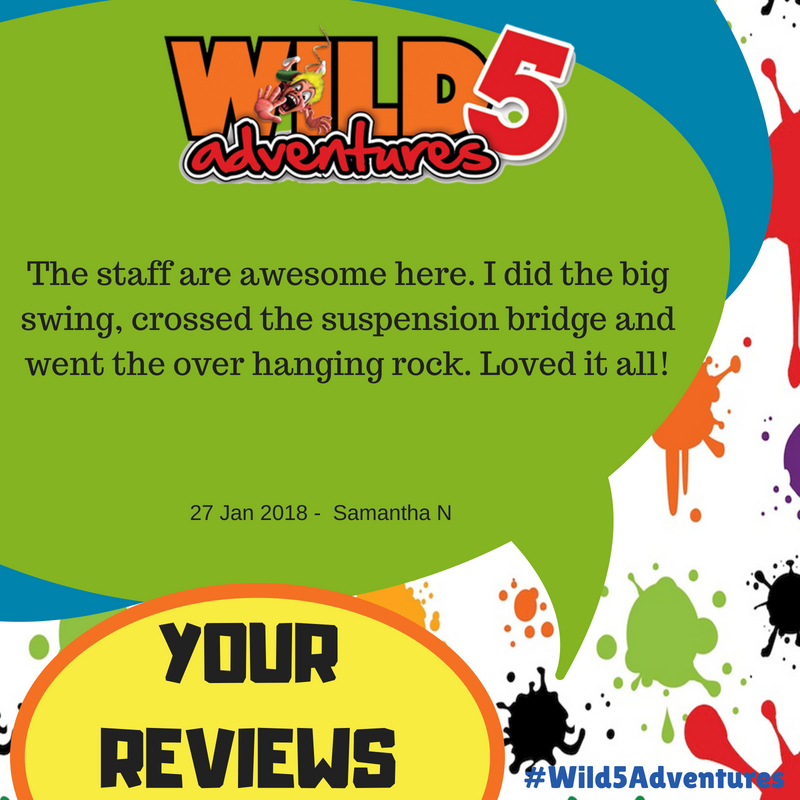 The 165m world record swing @ Oribi Gorge has been on my bucket list for ages! All I can say is I highly recommend the experience if you are an adrenaline junkie! Wild 5 adventures is based at the Oribi Gorge Hotel. They offer five activities which include the wild swing, white water rafting, abseiling, wild slide and the suspension bridge. 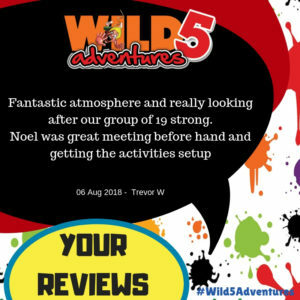 Prices vary from R250 to R550 for the activities. Note you will have to pay an entrance fee at the park entrance even if you do not wish to partake in the activities. 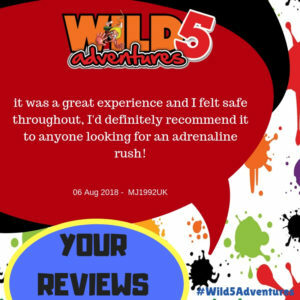 Most of the activities can be done on the day without prior appointment, however the white water rafting requires a booking and minimum six people. The paintball requires prior booking as well. No SUV is needed to navigate the terrain, however I am unsure if a car with a very low suspension will make the journey of a few kms. Upon arrival at the view site, the views are absolutely breath-taking and a spectacular testament to Mother natures work. Wear comfortable clothe and walking shoes. The bathroom facilities are a bit of a walk from the reception, so perhaps the elderly might struggle. However the facilities are super clean and very well maintained. The staff from the reception to the adventure guides are well placed. They are absolutely friendly and all with a fun loving disposition. The guides I have noticed do well to ease the customers nervousness. It is apparent that safety is of great concern for all the personnel as well your pleasurable experience. You can witness the activities with great views if you do not wish to participate. The wild slide offers a great view of the gorge. However you have to cross the suspension bridge to partake.